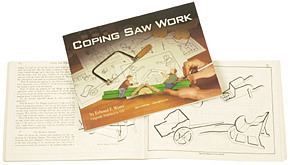 Originally published in 1927, many of the projects in Coping Saw Work provides plans for several wooden toys. The large format (11" x 8") features 121 full-scale illustrations within its 136 pages. The great value of Coping Saw Work is in its hundreds of full-scale patterns, particularly for the mechanical toys that were popular in the early 1900s. Among them you will find plans for a pendulum-actuated circle of pecking chickens, the traditional competing woodchoppers, jointed animals on moving stands, and a number of parallel-movement toys such as the classic fighting dog and cat. Equally useful are the numerous full-scale drawings for dollhouse furniture and toy vehicles. You can get a new print of Coping Saw Work over at Lee Valley Tools or try for an original printing of Coping Saw Work at Amazon.